Doyle Brunson Poker Profile - "Texas Dolly"
Doyle Brunson is a living legend in the poker world, and was recently voted as the #1 most influential force in the poker world by Bluff magazine. Brunson has been involved in poker for over 60 years, and continues to play and dominate his opponents to this day. He has not only won several major poker championships, but has written various books, gone through some of the most dangerous poker situations on Earth, and survived major traumatizing personal events in his life. Brunson began his rein in the poker world far before the game became the phenomenon it is today. During the 1950s he played in underground games in Texas, which were some of the most dangerous games in the country. At the tables Doyle competed with thieves, cheats, robbers, and pimps, and Brunson often ran into trouble in his time at these games. Not only did Doyle have to avoid police detection in these illegal games, but he also had to be fortunate enough to dodge cheaters and cons. And, if he actually made some money during his session, he had to pray that his opponents would actually pay him and let him walk away with his earnings. Brunson recalls entering into numerous life-threatening situations during his early years of poker playing, and states that he's glad that poker has become a legitimate, safe business nowadays. Once Doyle discovered civilized poker rooms in Las Vegas, he decided to make a career out of poker. Prior to this, he held a sales job in Texas, but realized that poker was much more profitable for him, and much more interesting. Brunson was the first poker player to accumulate $1 million in tournament winnings, including big cashes in the World Series of Poker and World Poker Tour. He is now tied with Johnny Chan as each hold ten WSOP bracelets, only topped by Phil Hellmuth's eleven bracelets. Two of Doyle's ten bracelets were won in consecutive years as Brunson took home the $10,000 WSOP Main Event No-Limit Texas Hold'em Championship in both 1976 and 1977. Doyle is also one of only five players to win both a World Poker Tour title along with a WSOP title. Doyle has written a number of influential books that any true poker player has read or practically memorized. His most influential book continues to be Doyle Brunson's Super System: A Course in Power Poker which he wrote in 1979 which was then followed by Doyle Brunson's Super System II in 2004. He has also written other very interesting books including Poker Wisdom of a Champion in 2003, Online Poker: Your Guide to Playing Online Poker Safely & Winning Money in 2005, and My Most Memorable Hands in 2007. Besides making a killing playing poker, Doyle has also parlayed his name and experience into a marketing opportunity. He is involved with an online poker room, DoylesRoom.com, and is the poster boy for the website. Doyle plays online exclusively at Doyle's Room along with friend Mike Caro and son Todd Brunson, so make sure to check out DoylesRoom if you'd like to play and chat with your favorite pros. 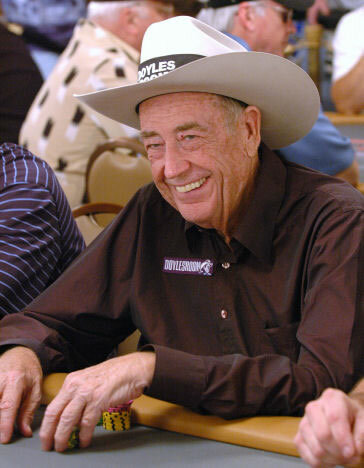 Doyle's Room is the only online poker room in the world that can confidently state "We have Doyle Brunson". Doyle plays exclusively at the site, and you can often find him playing online under his username "Tex_Dolly". Plus, Doyle's Room is currently offering a 110% up to $550 bonus for all new depositors, including Americans. Learn more at our DoylesRoom.com Review. Doyle married his wife Louise in 1962, and the couple has two children, including Todd Brunson, another pro poker player. Doyle discovered a cancerous tumor in his neck not long after Louise became pregnant with their first child. Doyle went in for surgery, hoping that the surgery would let him live love enough to witness the birth of his daughter, but doctors declared his tumor incurable. However, soon after the surgery the doctors had found that the cancer had mysteriously disappeared; a medical miracle. Doyle's wife, strangely enough, went through the same thing; she was diagnosed with incurable cancer, had surgery, and miraculously recovered. The Brunson's claim that their deep faith allowed them to recover from cancer. Doyle's son, Todd Brunson now plays poker professionally, and the two are the only father/son pair to both hold a bracelet at the WSOP. Todd won the Omaha Hi-Lo bracelet in 2005, and Todd's daughter plays as well and actually outlasted both Todd and Doyle in the 2007 Main Event at the WSOP in Las Vegas.